Make sure you don't miss this magical night! 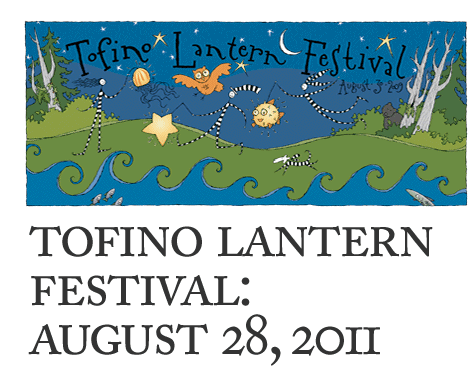 On Sunday August 28th, 2011 the Raincoast Education Society is sponsoring the Seventh Annual Tofino Lantern Festival at the Tofino Botanical Gardens. During the week leading up to the festival, residents and visitors can come to the Raincoast Interpretive Centre to build their own candle lanterns to carry along the garden trails (check the calendar below for workshops at Word's End Booksellers and the Clayoquot Field Station). The following is a list of events during the Tofino Lantern Festival from last year. This year's calendar of events will be posted closer to the actual event. The event begins at 6:30 with Childrens hour (face painting, puppet shows, bubble shows, childrens music and much more). At 7:30, Tofino's top local musicians will take the stage and begin the soundtrack of the evening while mysterious lantern elves prepare the garden trails for the onset of darkness! Relax with delicious sobo treats and enjoy the music until the garden trails open at 8:30pm. A preliminary opening will be available at 7:30pm for little ones unable to make the 8:30pm opening. The Tofino Lantern Festival is Drug and Alcohol Free! Plans for this year's festival are well underway, so now is the time to get involved; make a lantern, sign up as a volunteer, get yourself a stylin' locally designed Lantern Festival t-shirt, or simply come enjoy a stroll through the magically lit gardens on Sunday, August 26th. Costumes are encouraged. If you would like to become a sponsor for this great community event please contact the Raincoast Education Society at (250) 725-2560. The Lantern Festival is a car free event! Please bike, boogie, or take the bus! The limited parking at the gardens will be reserved for staff and volunteers. Lantern Workshops at the Raincoast Interpretive Ctr. The Tofino Lantern Festival, on August 28, 2011 at the Tofino Botanical Gardens, is a fundraser for the Raincoast Education Society in Tofino.